Seoul Adventure: Skiing, Korea Style! After suffering through bone-chilling cold the first part of winter in South Korea, the weather has finally warmed to near-freezing here, making it a great weekend to try myself on the ski slopes near Seoul. 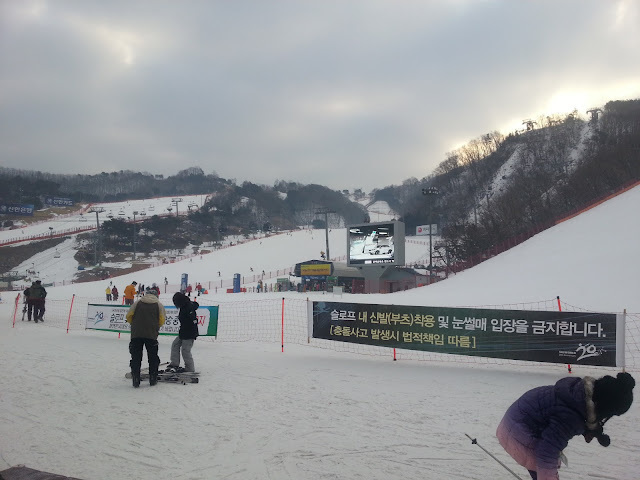 Thankfully, there is decent skiing within a day trip of Seoul to entertain us during the winter months. 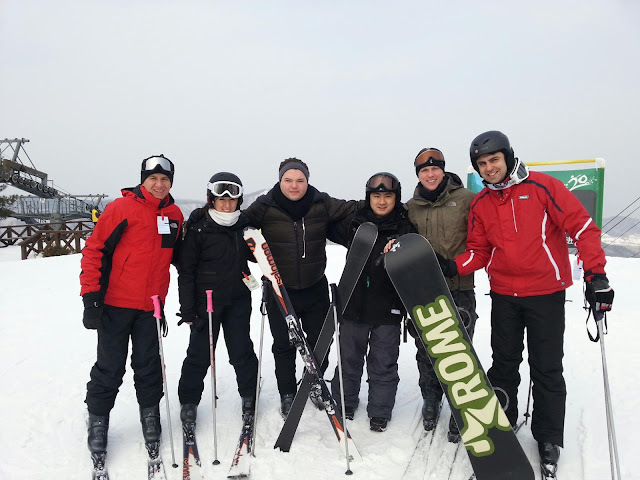 I set the alarm early Saturday morning and caught the 7AM bus with a group of my work colleagues to Daemyung Vivaldi Park Ski World, located a little over an hour's drive east of the city. We could have used some sun – I think Chinese air pollution is blocking the sky currently – but otherwise the conditions were pretty good. In fact there was less ice on the slopes than I was expecting. The resort wasn't very big, only 10 runs, and the slopes were quite crowded by midday with a lot of snowboarders (yuck). The difficulty level of the terrain was not hard though, so the only difficult part of skiing was dodging all the other people on the mountain. Even the "expert" slope would only be considered a blue at a US resort. 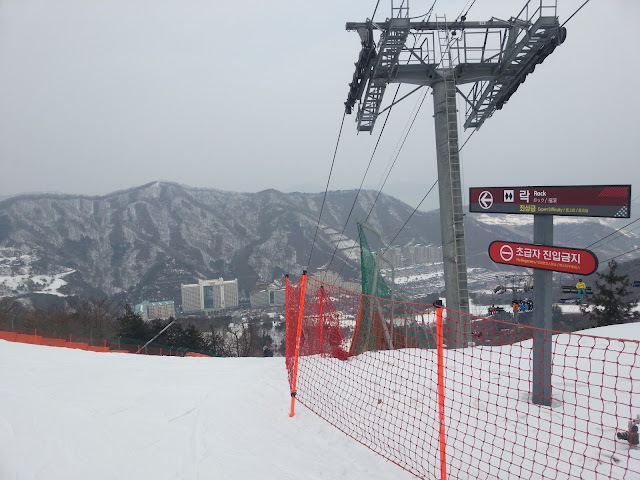 In fact, the "expert" slope was the most pleasant as it was the only run not densely traveled...either most Koreans are novice skiers or the experts go to better resorts in Korea (the best skiing is reputed to be on the east coast of the peninsula). 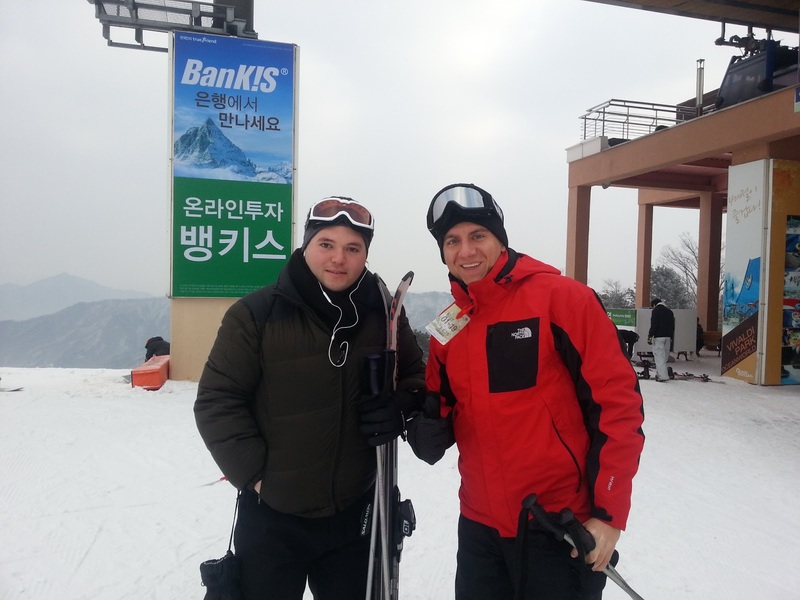 We only skied for about 4 hours, then grabbed some snacks (I had ramen noodles) and returned to Seoul mid-afternoon. With our Samsung employee discount the price was quite cheap, about $35 with the ski rental so despite the mediocre terrain I felt we received good value for our ski currency. I could become a regular Korean ski bum at that price! I want to ski too if my schedule permits me. Been busy during the winter season. Anyways, maybe we could follow each other on Bloglovin and/or GFC?